Ready for Game Day while you're on the Whole30? 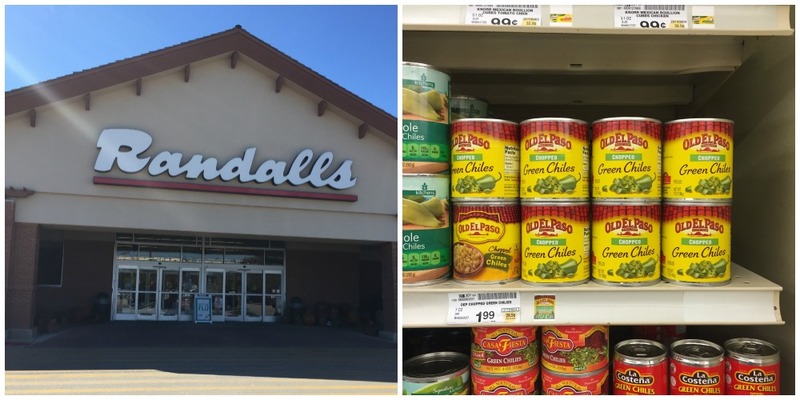 If you've been around Frugal on the Prairie for a while then you know what huge football fans we are. We have literally worked schedules and birthday parties around games on the weekend. I know that sounds a little insane, but it's just something we're passionate about in our family. I'm sure you've noticed my family is doing the Whole30 for the month of January so our Game Day recipes will not be including the carb-filled, sugary stuff I usually cook. I'm excited to be including this yummy recipe on one of our favorite days of the week. 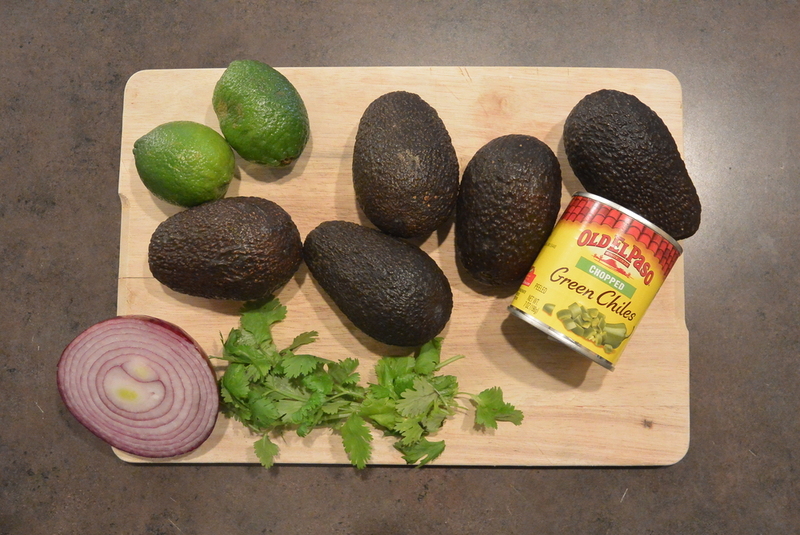 This past weekend I shopped at my local Randalls to make this delicious guacamole recipe that I've tweaked a little to make it Whole30 compliant. 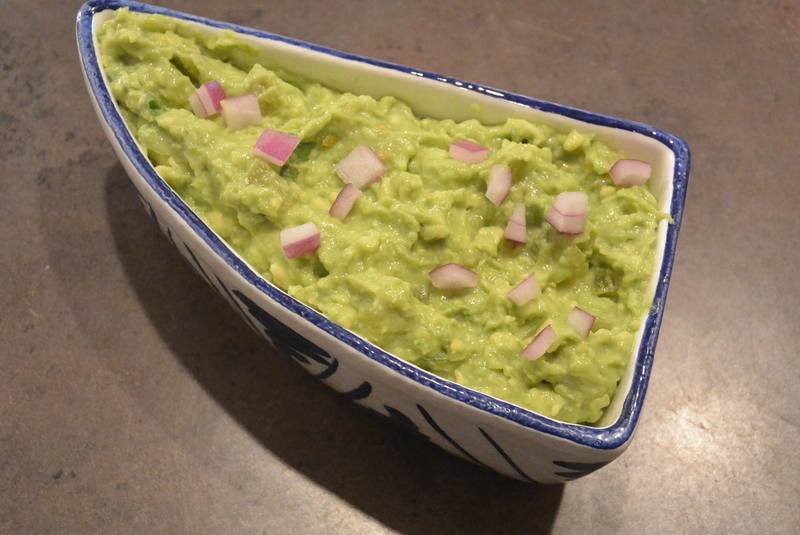 Guacamole is like the official family dip for every vegetable in our house. We love it! 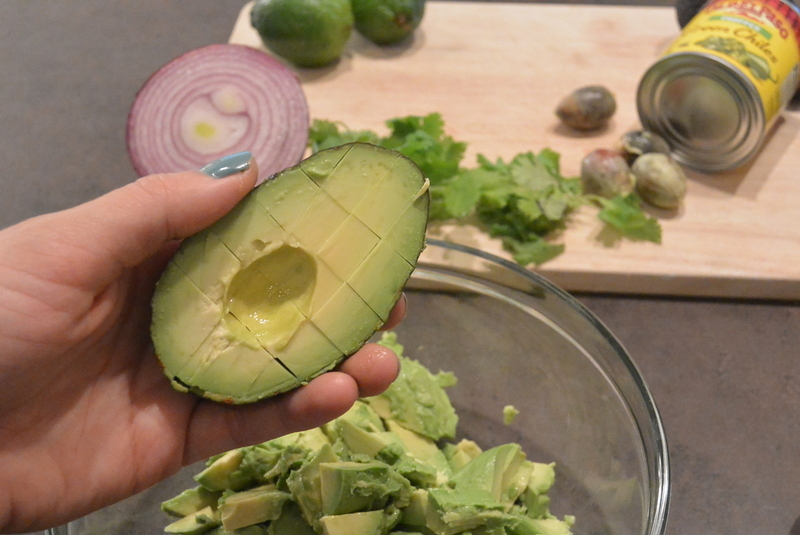 In medium bowl, mix all ingredients except onion, mashing avocados. Sprinkle with onion. Enjoy! 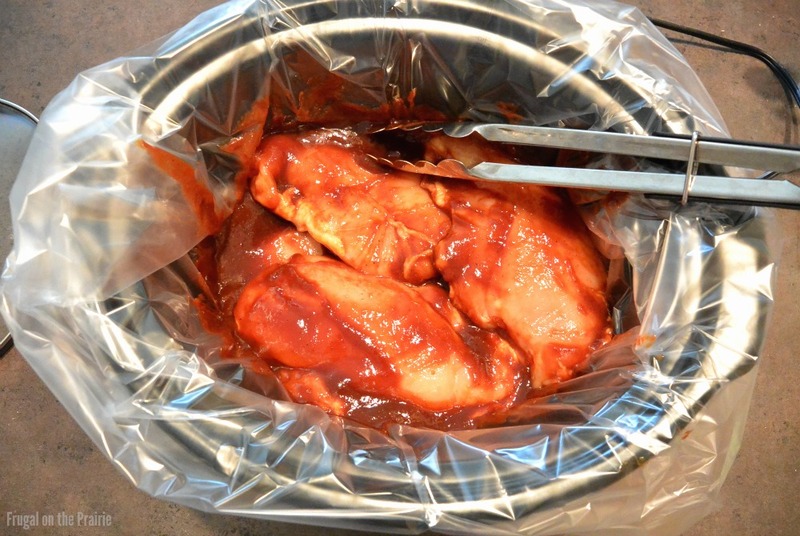 What's your favorite Game Day recipe? Let me know on Facebook or Twitter with the hashtag #oldelpaso :)This is a sponsored conversation written by me on behalf of Albertsons. The opinions and text are all mine. Are you ringing in the New Year with healthy resolutions? 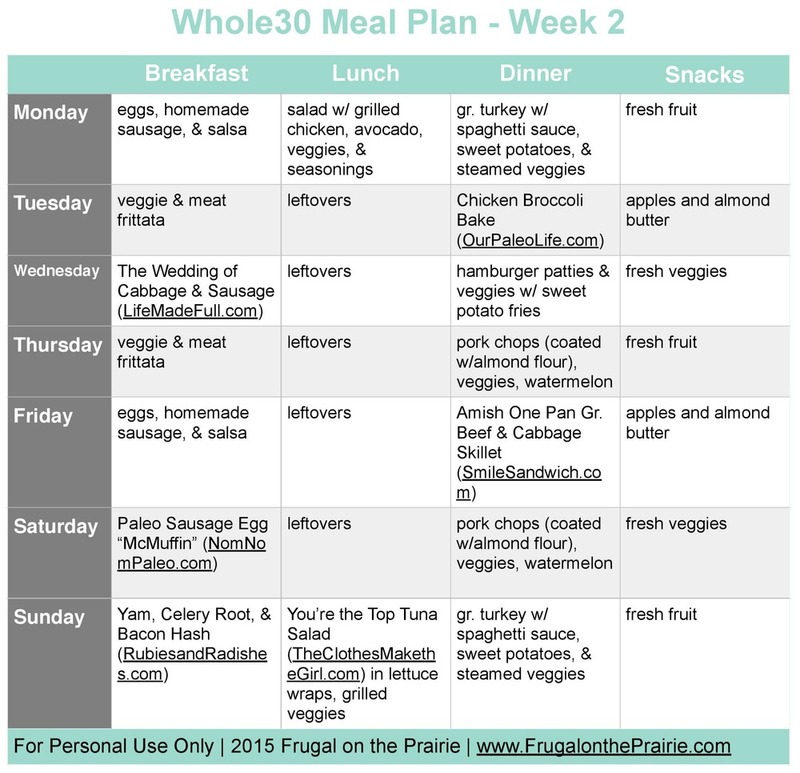 Planning on doing the Whole30 with your family but worried about how it will go? My family and I did it and survived so we've got a few tips to share! Today I'm guest posting at My Love for Words blog and sharing all of my secrets for making the Whole30 work with a family. It's easier than you think but there are some MUST DO's on the list so don't miss it. If you're unfamiliar with this program, here's a very brief description: The Whole30 diet is where you strip out all foods that have a poor impact on your health, such as sugar, grains, dairy, and legumes. Interested in some Whole30 meal plans and other tips? I've got plans for Week 1, Week 2, Week 3, and Week 4. I also have a list of things you should know before you start the program. Note: I am not affiliated with or endorsed by the Whole30 program or it’s authors in any way. All views and opinions are my own and based on my personal experience. Please consult a physician before you make any drastic changes to your diet. 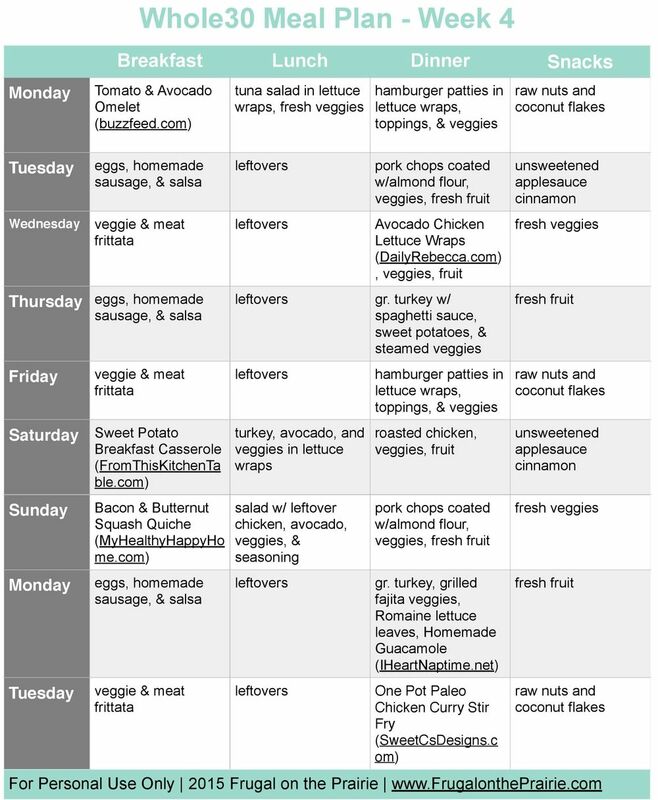 I recently mentioned that my husband and I were doing the Whole30 eating program for the month of June. If you're not familiar with how it works you can visit the official Whole30 website for a more detailed explanation. Here is my humble and brief summary. The Whole30 is a program where you strip out all foods that have a poor impact on your health, both physically and psychologically. You may not think certain food groups affect you negatively but the Whole30 adopts the belief that all sugar, grains, dairy, and legumes should be eliminated from your diet and replaced with more wholesome, natural ingredients. The first thing you should know is that my meal plans for the Whole30 are extremely basic. When I say extremely basic I mean that Thursday's dinner was prepared by cooking ground turkey with spaghetti sauce, microwaving sweet potatoes, and steaming whatever veggies we had in the refrigerator. I also plan leftovers for almost every lunch as a way to accommodate our busy schedule. I wish that I had the time and energy to cook fancy recipes for my family. I wish there was room in my budget for items like salmon and steak every other night. But the baby lives on my hip, our grocery budget is tight, and there isn't much I can do about it. If you're looking for an elaborate meal plan, this is not the plan for you. 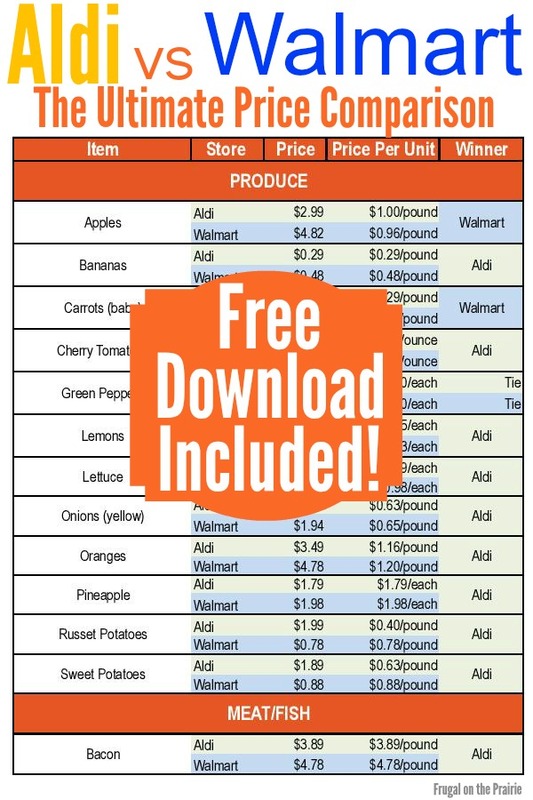 If you are a busy individual who wants to try the Whole30 without doubling their grocery bill, then you are in the right place! 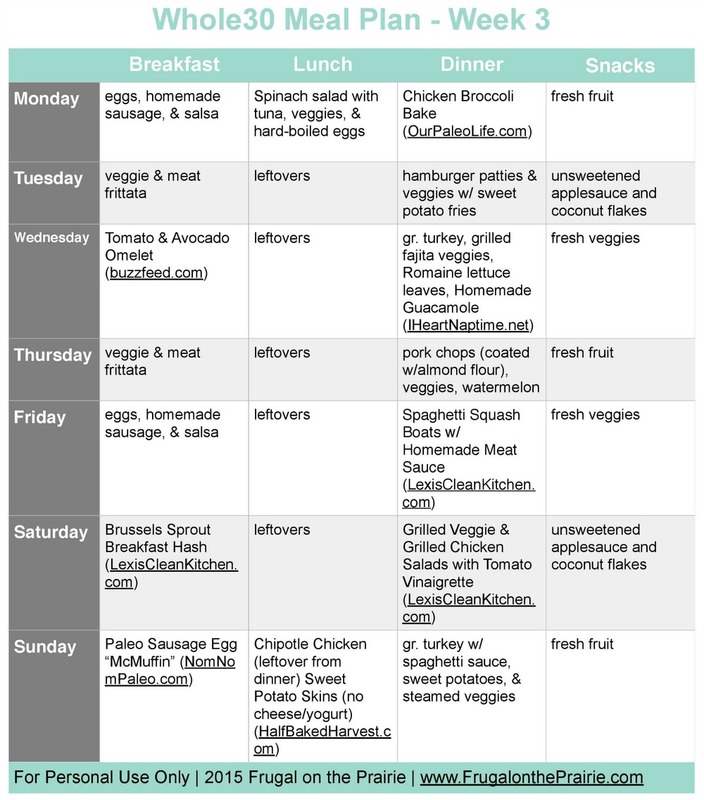 Behold, The Busy Person's Whole30 Meal Plan for the last week of the program. I added an additional two days to the menu so you could have a full 30 days worth of ideas. Please note that this menu is suited for two adults. We personally followed this menu as close as possible. Recipes may have been switched around due to the time constraints of long workdays or a fussy child. Also, be sure to save some chicken from Saturday's dinner to use in Sunday's lunch. Also, this post may contain affiliate links. Please read my Disclaimer for more information. I didn't shake things up too much, even with this being our last week on the program. But I was excited to find some new yummy recipes from From this Kitchen Table, I Heart Naptime, My Healthy Happy Home, Sweet C's Designs, Daily Rebecca, and Buzzfeed. Pinterest has also been a great source and I constantly use it for reference and inspiration. I should note that one of these recipes called for bacon. But Whole30 compliant bacon is insanely(!) expensive so I used whatever extra meat I had on hand instead. I've been exclusively using the Whole30 website for guidance, but if you'd like an actual paper copy of rules, guidelines, recipes, and tips, the The Whole30: The 30-Day Guide to Total Health and Food Freedom is a great resource! I also love reading It Starts with Food (written by the Whole30 founders, Dallas and Melissa Hartwig) for even more inspiration. The beginning of this week was fantastic! I felt stronger and more dedicated to the Whole30 program than ever. I loved the food I was eating and my unhealthy cravings were not only non-existent, but any sugary and non-compliant foods also looked downright unappealing. It was the first time in my life that ice cream didn't look good. I know this sounds crazy but it made me feel like I was finally in charge of my own body. It was awesome! However, my last few days on the program were surprisingly difficult. I started thinking, "Well, 27 days is basically the same as 30 so..." Our work and life schedules also became increasingly hectic as we got closer to the end of the month. Did that influence things? Maybe a little bit. Subway sandwiches always look so much easier than whipping up a hot meal. But I stuck it to the end and I'm officially done. BAM! Let's just say that the morning after Day 30 I did a happy dance on my way to the kitchen. 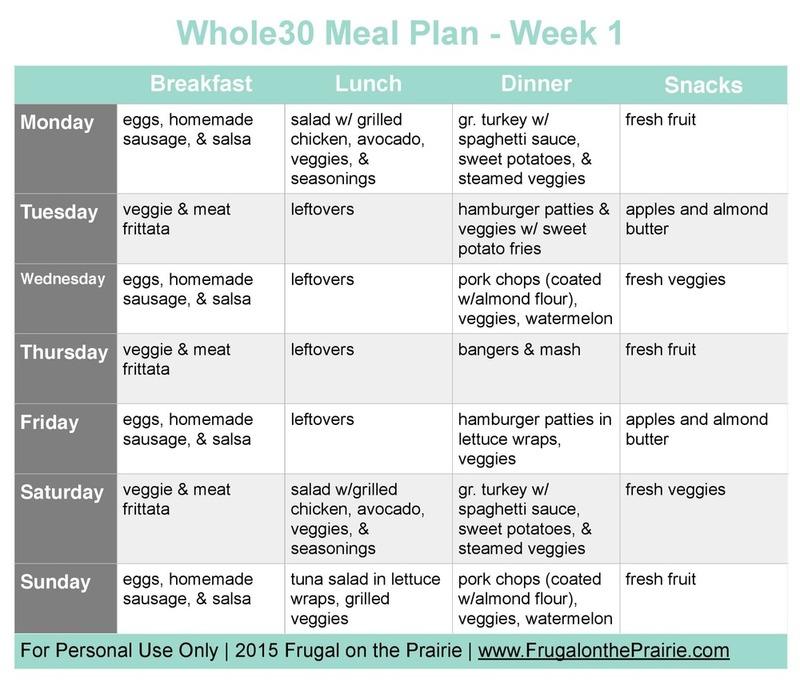 I was pleasantly surprised to find myself still reaching for Whole30 meals following the 4th week. When your body feels good you can't help but continue to eat healthy! Are you trying the Whole30? What has been your experience so far? Love/hate it? Give me all the details! The first thing you should know is that my meal plans for the Whole30 are extremely basic. When I say extremely basic I mean that Sunday's dinner was prepared by cooking ground turkey with spaghetti sauce, microwaving sweet potatoes, and steaming whatever veggies we had in the refrigerator. I also plan leftovers for almost every lunch as a way to accommodate our busy schedule. Behold, The Busy Person's Whole30 Meal Plan. Please note that this menu is suited for two adults. We personally followed this menu as close as possible. Recipes may have been switched around due to the time constraints of long workdays or a fussy child. Also, be sure to save a little chicken from Saturday's dinner to use in the recipe for Sunday's lunch. Also, this post may contain affiliate links. Please read my Disclaimer for more information. I stumbled onto Lexi's Clean Kitchen this week and went a little crazy. She's got so many delicious Whole30 recipes that I just couldn't help myself! I also used a few from Nom Nom Paleo, Half Baked Harvest, and Buzzfeed. I've been exclusively using the Whole30 website for guidance, but if you'd like an actual paper copy of rules, guidelines, recipes, and tips, the The Whole30: The 30-Day Guide to Total Health and Food Freedom is a great resource! For inspiration to keep me going, I've been loving It Starts with Food by the creators of the Whole30, Dallas and Melissa Hartwig. I've never felt better in my entire life. My energy is endless, I sleep like a baby, and my body feels strong and healthy. And my skin! I have the same glow I had before I went through my hormonal teen years. Despite all of these incredible perks, my cravings for unhealthy food seem to be on my mind constantly. Maybe my body is thinking, "You already feel so good so a cookie or two isn't going to hurt you." The closer I get to the end of the month the harder this becomes. The first thing you should know is that my meal plans for the Whole30 are extremely basic. When I say extremely basic I mean that Monday's dinner was prepared by cooking ground turkey with spaghetti sauce, microwaving sweet potatoes, and steaming whatever veggies we had in the refrigerator. I also plan leftovers for almost every lunch as a way to accommodate our busy schedule. Please note that this menu is suited for two adults. We personally followed this menu as close as possible. Recipes may have been switched around due to the time constraints of long workdays or a fussy child. Also, this post may contain affiliate links. Please read my Disclaimer for more information. 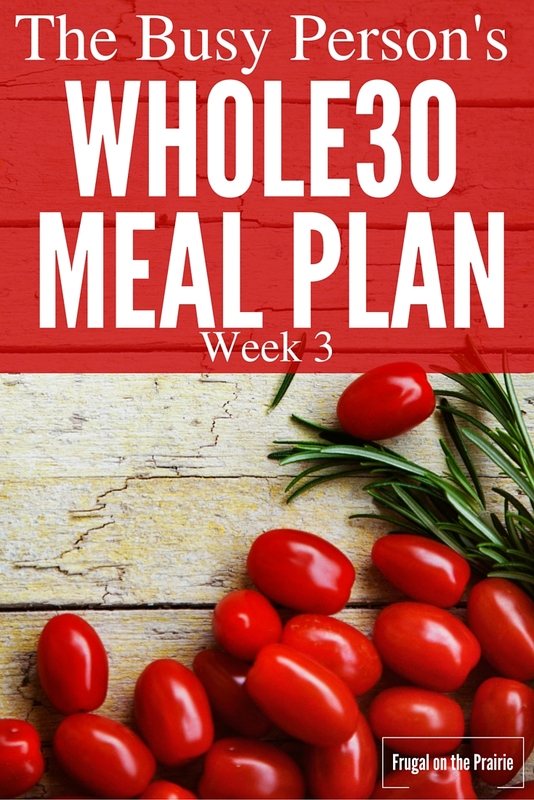 This week I used the Whole30 website as a guide and found some new recipes from Nom Nom Paleo, Smile Sandwich, Our Paleo Life, and Life Made Full. Pinterest has also been a great source and I've been building up a nice collection of recipes. I should note that one of these recipes called for bacon. But Whole30 compliant bacon is insanely(!) expensive so I used ground turkey instead. I've been exclusively using the Whole30 website for guidance, but if you'd like an actual paper copy of rules, guidelines, recipes, and tips, the The Whole30: The 30-Day Guide to Total Health and Food Freedom is a great resource! I also love reading It Starts with Food by Melissa and Dallas Hartwig for even more inspiration. There are some repeats from last week's menu and here's why: I'm cheap. Really cheap! It's as simple as that. But I had more time on my hands towards the weekend and was able to find some new, affordable recipes. The headaches from last week are completely gone and have been replaced with the best sleep of my life. My mid-morning and mid-afternoon energy slumps have also disappeared. I have never felt this energized before and the extra pep in my step is all the encouragement I need to keep up with the program. *I prepped the cabbage the night before to make for a quick breakfast. **I replaced the bacon with ground turkey because it's cheaper. I constantly browsed the Whole30 website, Our Paleo Life, and The Clothes Make the Girl for recipes and ideas. I don't have the money or patience for half of the fancier dishes but I got lucky and found the following recipes. Pinterest has also been a source lifesaver and I'm still pinning away like a madwoman. Anything else listed on the menu was made very low-key. For example, the eggs were either scrambled, boiled, or fried. It's a real life meal plan, people. I've been exclusively using the Whole30 website for guidance, but if you'd like an actual paper copy of rules, guidelines, recipes, and tips, the The Whole30: The 30-Day Guide to Total Health and Food Freedom and It Starts with Food are great resources! Headaches in the morning. Headaches in the afternoon. Headaches in the evening. If there's one thing I can tell from the first 24 hours of this program, it's that I am addicted to sugar. I didn't gorge myself on carbs or candy the night before like I wanted to and I'm glad I didn't! My head was constantly pounding the entire week and all I needed wanted to do was pour a bag of Skittles down my throat. 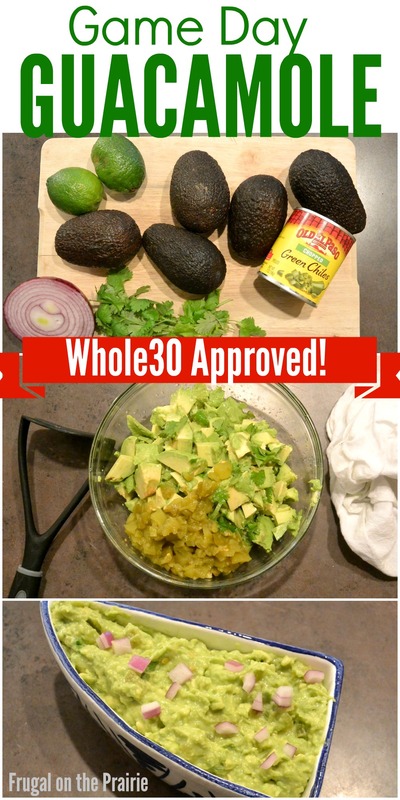 I quickly realized that Whole30 recipes can be Paleo compliant but not the other way around. The limitations were killing me and I realize how pathetic that sounds. I've become too used to easy/fast/cheap foods. The fact that I was dragging my feet to make something fresh and healthy is ridiculous. At the end of Week 1 I made it a goal to branch out and find new recipes.